NiMH batteries require a NiMH battery charger. Ready when you are! Pre-charged and retains 85% of charge after 1 year of storage. There is a $10 Cdn ($8.00US) shipping and handling charge. 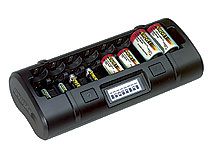 Ni-MH batteries should be charged with a NiMH compatible charger.